Cooking food without the aid of fire, electricity, or gas might seem like an impossible feat. This is not an inconvenience for people who know how to harness solar power. The sun is a limitless source of energy to use for cooking food. 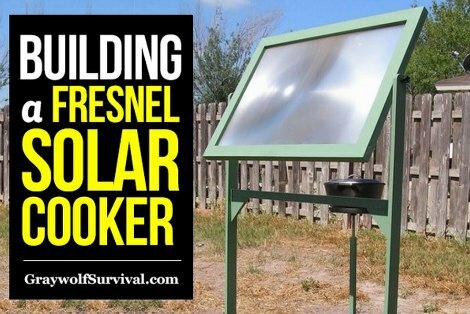 All you need is the proper materials to build a homemade fresnel solar cooker. The most important element of a fresnel solar cooker is magnifying the heat from the sun. This is done using a special type of lens you can find by looking online. The next step is to build a basic frame that is used to house the lens for your fresnel solar cooker. The housing for your lens will need to be positioned based on where the sun is in the sky. You can find the materials to build the frame for a fresnel solar cooker at a home improvement store in your area. A few pieces of lumber is all that should be needed to build the frame. However, you need a variety of tools to complete this project. This includes a saw, a power drill, and screws. These tools may already be in the garage or workshop at your home. Another important detail to keep in mind is the type of cooking vessel to use. The best option will be a black dutch oven as black will absorb heat. If a lighter color vessel is used, then the time needed to cook may be much longer. A stand should be built separate from the frame used for your fresnel solar cooker. The temperature of your fresnel solar cooker will vary based on weather conditions and various factors out of your control. If you want to find the exact temperature of your cooker, then a basic digital thermometer or thermal thermometer is a great tool to have handy.